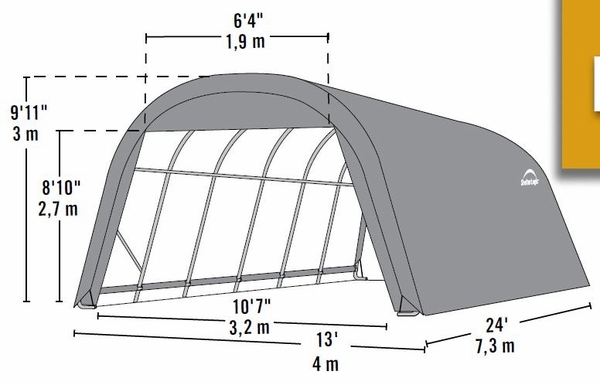 Protect your vehicle from the elements with this portable round garage canopy. Constructed of sturdy beam welded 1 5/8 inch diameter 17 gauge steel, it has been designed to resist weather damage and aging and features a 13 step Rhino Shield surface preparation process as well as DuPont thermoset baked on powder-coated finish to eliminate rust and chipping. Assembly is easy with slip fit connectors and swedged tubing. This canopy comes with wide-based foot pads for stability, a fitted 9 oz. one-piece valance cover, and 7 rib framework. Its patented Twist-Tite technology ensure a secure, wrinkle-free fit between the cover and framework, while Easy-Slide Cross Rail clamps ensure a secure, locked down shelter. The cover is heat-bonded and constructed of triple layer polyethylene to lock out water and has been UV treated to prevent fading, aging, and fungus damage. 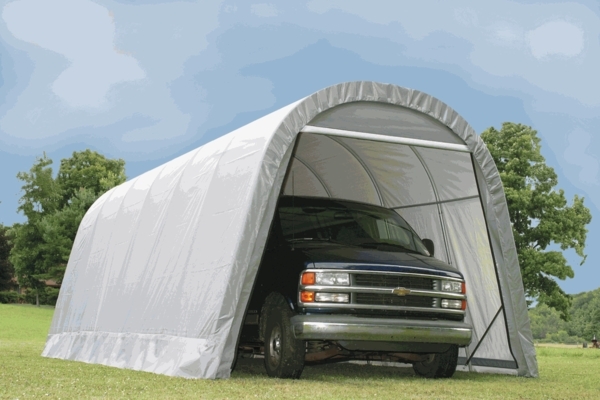 This garage canopy comes with a one year warranty. Overall, a great building, easy to assemble. Instructions are poor, had to download better instructions from the web. Purchased door roll-up kits for the door and they don't work on round top structures as designed. Had to roll up on outside of building because of tapered inside walls, otherwise, Id be giving 5 stars overall. A very reasonable, easy to assemble garage that provides protection for my tractor from the elements. I was amazed at the ease of assembly and the quality of this product.